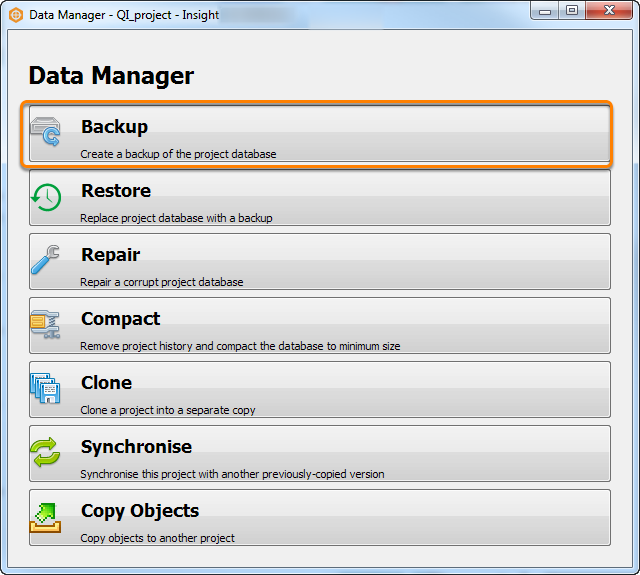 Data Manager allows you to create a backup of the project database in a preferred location. Tip: For more information on backing up your project, see How should I backup my project? in the FAQ section. 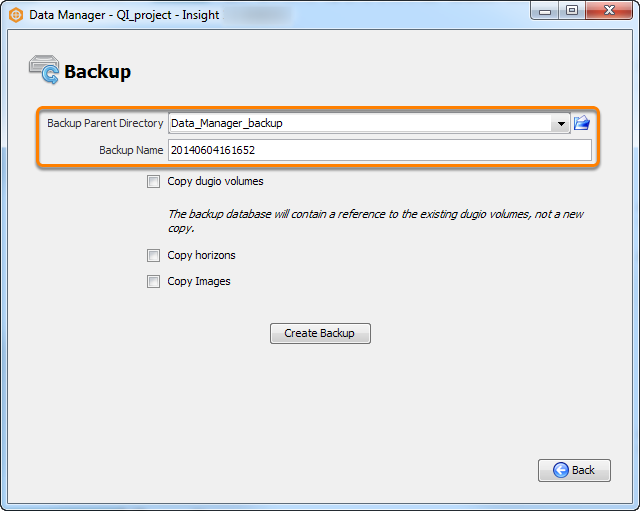 In the Data Manager window, click Backup. Note: The project you open in the Insight Launcher will be the project that you want to backup. At the Backup Parent Directory field, click the folder icon on the right. Browse to the directory where you want to keep a copy of your project database, or create a new parent directory. Click Save. After selecting the parent directory, type a name for the Backup folder inside the parent directory (by default, Data Manager sets the name as the current date and time). 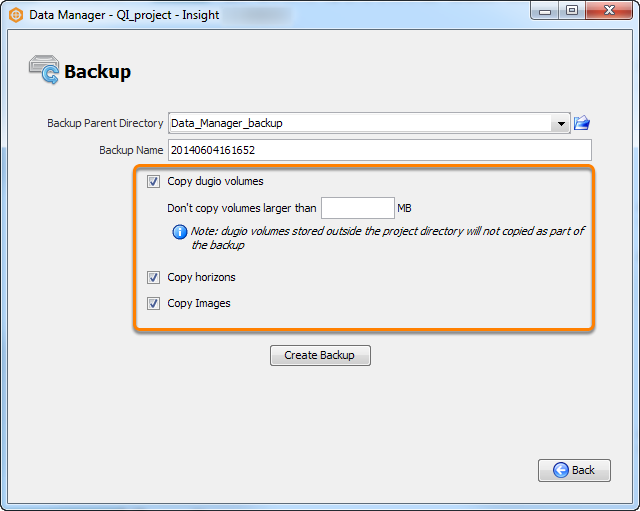 Select the Copy dugio volumes check box to create a copy of the dugio volumes in the backup project. Optionally, specify the maximum size of the volumes to be copied in the Don't copy volumes larger than X MB field. Select the Copy horizons/Images check box to include all the horizons and images from your project in the backup project. 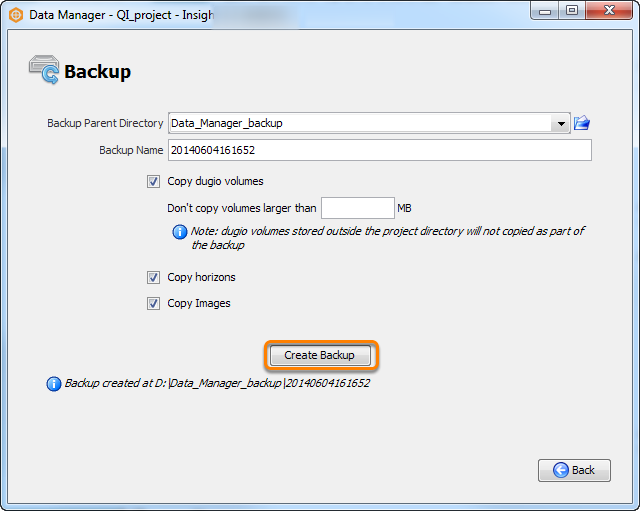 If you do not select the Copy dugio volumes checkbox, the backup will only copy references to the existing dugio volumes instead of creating a new copy. When you are ready, click Create Backup to copy your project. Once the backup is complete, a notice will appear to confirm that the backup has been created at the path you specified.